Last Saturday saw top ranked former UFC contender Rory “The Red King” Macdonald announce his arrival in the incipient Bellator promotion by choking out British knockout artist Paul “Semtex” Daley. Macdonald had, in his usual cold, methodical way, entered the cage on light feet and had taken Daley down and controlled him with ease. Few were surprised. Daley was the picture in the dictionary next to “explosive striker”, but he had never walked in the same company as Macdonald had. Once upon a time, Macdonald had been hailed as a world beater. Teammate George St Pierre had predicted that his young mentee would surpass him in his achievements, and indeed the young Canadian felt like a 2.0 version of St Pierre. Seven years after his UFC debut, Macdonald’s first victory in a second-rate MMA promotion over a perennial journeyman like Daley felt like a bittersweet concession. His transition to Bellator read like a confession that the predictions of Rory’s greatness to come had been wrong, that Macdonald would never reign supreme in the big leagues, and was better off beating up lesser fighters in a lesser promotion. The gangly Canadian, who used to walk out to the cage stonefaced to Rihanna’s “We Found Love”, had been the prototype of the “new” MMA fighter. MMA fighters until recently almost always came from a traditional combat sports background. The newness of MMA meant that few had had the luxury of growing up with it. Instead, MMA fighters often had a half-baked quality to them. Wrestlers trying to throw punches. Kickboxers struggling to learn to grapple. The common wisdom had always been that a kid who grew up training specifically for MMA, who wrestled and boxed and did jiu jitsu and kickboxing from the beginning would be dominant. Rory had been that kid. Macdonald had entered the public eye at the tender age of twenty two for his furious dogfight with perpetual title contender Carlos Condit. 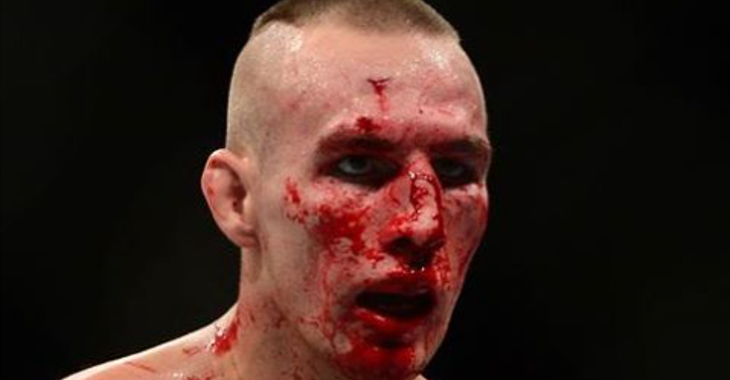 Rory Macdonald had lost, brutally, but the young Canadian had put up a hell of a fight, going toe to toe with the ferocious Condit and earning the respect of the MMA world. He’d gone on to a blazing 5-0 after this, outclassing opponents like Che Mills and BJ Penn with his technical, well rounded striking and powerful wrestling. Because Macdonald wasn’t a specialist, he could always take the fight into an area he was better versed in than his opponent. MMA has always been a game of stylistic rock paper scissors, but Macdonald had all three implements in his possession. He could submit strikers, outstrike wrestlers, and wrestle submission artists. His ascendancy to the UFC championship seemed inevitable. But there were falters. Macdonald broke his winning streak on a split decision to Robbie Lawler, a high school wrestler turned MMA fighter, before resurging with wins over Tyron Woodley, Damian Maia, and Tarec Safferdine. However, a brutal rematch with Robbie Lawler left Macdonald with a spectacularly destroyed nose and another loss on his record. For the first time in that fight, we saw Rory break mentally and physically. After three rounds of nihilistic mutual destruction, Lawler had floored Macdonald with a thunderous punch, and we had all seen the look in his eyes as Rory had, dazed, reached up to touch the place where his nose had been. We had seen him break. His next fight, a showdown with ascendant striker Stephen Thompson had been a test. The MMA kid vs the Karate Kid. Against the lanky point-karate specialist, Rory had looked clumsy and flat footed. Thompson’s bladed stance, his in-and-out movement, his lunging style almost reminiscent of an Olympic fencer’s jab had proven to be a puzzle too great for Macdonald. Instead, he tumbled again and again for the legs of Thompson, repeating the hail-mary play again and again, looking for a leg-lock (a nod to a training camp spent with leg lock master John Danaher), and each time his ploy was more obvious, more telegraphed. Ultimately, Macdonald came up short against the karate stylist. His resignation from the UFC followed. Rory’s victory over Daley was methodical and conservative. The cerebral Canadian fighter took few risks against the British striker, repeatedly taking him down and forcing Daley to exhaust himself wrestling back to safety. In Daley’s guard, Macdonald closely followed the template of his mentor St Pierre, using the “can opener” technique to force Daley to open himself up defensively. In the second round, Daley gave up, turning his back to Macdonald in a motion that in MMA fighter universally translates to “please end it.” Macdonald happily obliged. Yet as the ref raised his hand, it felt melancholy. In Bellator, Rory would find few capable of unseating him. The king would reign in exile, and the fans would wonder at what could have been.